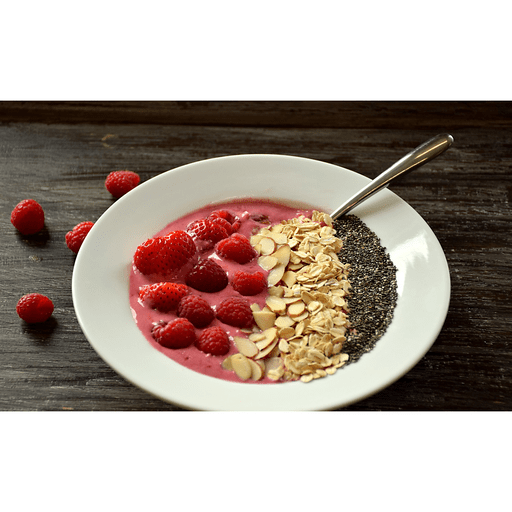 Smoothie bowls are the latest craze in the smoothie world, and we have everything you need to know to build your own creation! 1. In a blender, pour in almond milk, raspberries, strawberries, Greek yogurt and almond extract. Blend on high, until mix is smooth. Pour into a large bowl and serve with a spoon. Calories 240, Total Fat 2g (Saturated 0g, Trans 0g), Cholesterol 0mg, Sodium 170mg, Total Carbohydrate 39g (Dietary Fiber 4g, Sugars 30g), Protein 16g, Vitamin A 8%, Vitamin C 90%, Calcium 35%, Iron 8% *Nutritional values are an approximation. Actual nutritional values may vary due to preparation techniques, variations related to suppliers, regional and seasonal differences, or rounding.